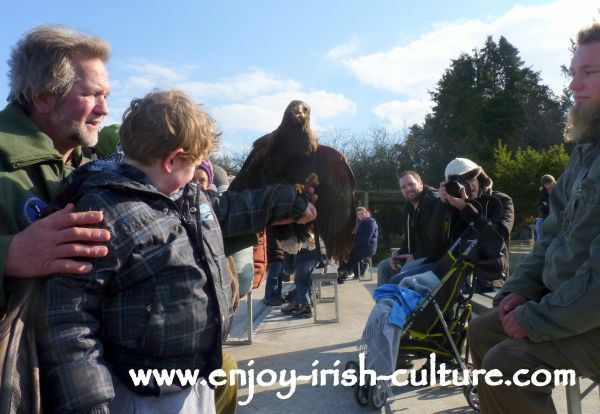 Eagles Flying in County Sligo is simply the best raptor show and bird of prey experience in Ireland, if not anywhere. Imagine coming as close to birds of prey as we did here! Quite a feeling, especially in the relaxed company of Lothar and Regina, both studied zoologists with years of experience of working with these wonderful creatures. Watch our video of the raptor show here! 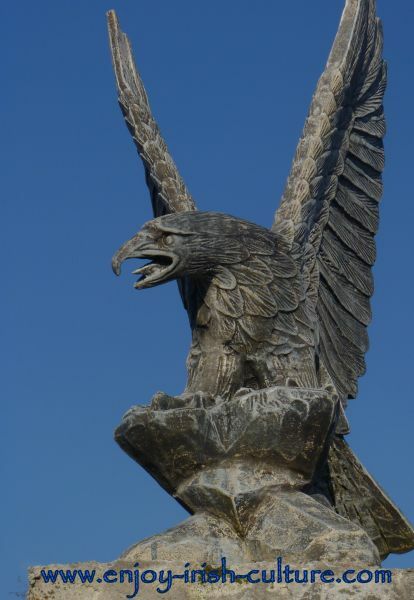 The story of Eagles Flying is a story of passion, one that started when Regina and Lothar moved to Ireland from Germany in 1999 with a great plan- the plan was to retire. They had visions of going mountain climbing or sailing on the Atlantic and doing no work at all. The idea of working with birds of prey only came to them a few years later when they started to look for mental stimulation and a sense of responsibility once again. 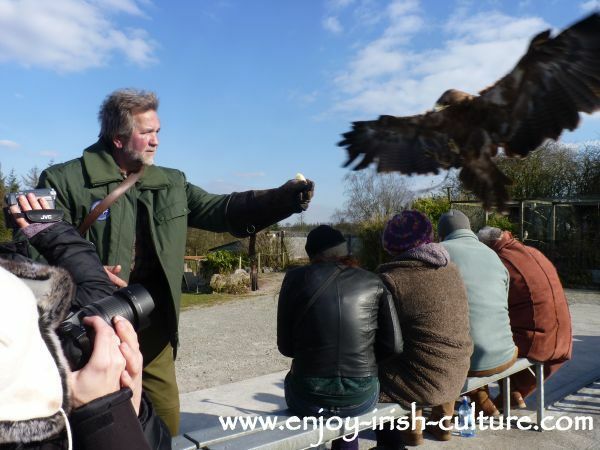 They made links with the programme for the reintroduction of eagles into Ireland, and it all took off from there. The raptor show however is only the ‘front page’ of the project, most of it will go unnoticed by the casual visitor. There is research on raptors going on at the birds of prey centre. There is a hospital part to the project which is very demanding in terms of labour input and cost. Eagles Flying now houses some 350 birds as well as some other wild life and domestic animals which locals tend to bring them when they are injured. By now, Lothar says, the couple have invested their lives savings in this project, all the money they had meant to retire on. Eagles Flying is an entirely private and privately funded project that receives no grant aid. The shows are on between Easter and October daily both at 11 a.m. and 3 p.m. There are toilet facilities and there is a small shop for snacks and drinks. The show takes about an hour. Plan time afterwards for the pet zoo. Don’t worry if it’s raining, they have an indoor area for the bird show. 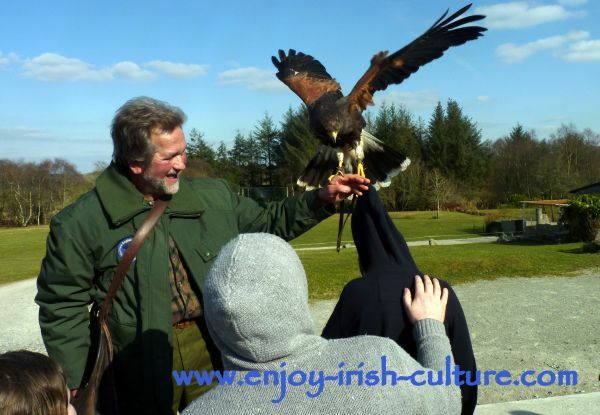 Eagles Flying is located at Templehouse near Ballymote in County Sligo. As you leave Ballymote heading for Sligo you will see a sign on your left for Templehouse. Follow the sign. After about 4 miles you will see a sign on your left for Eagles Flying. Coming from Galway on the N17 pass through Tubbercurry. Keep going and pass Anchory Creamery as well. Keep going, and 6km further onlook for the walls of Templehouse demesne on your right. Take the first right after that (for Bunnanaddan and Ballymote) which will lead you to the white gates of the Templehouse estate. Pass Templehouse and keep going straight, take the next left and keep going to the gate of EF. Coming on the N4 from Dublin or Sligo, turn for Galway (N17) at Toberbridge roundabout. Go through Ballinacarrow and take the second left, there is a sign for EF. The only source of income of the project are the fees that visitors pay for the spectacular one hour long show which costs just under 10 Euros per adult, 6 for children. To put that cost in context: the running cost of Eagles Flying is 800 Euros per day, this is only for feed and wages! 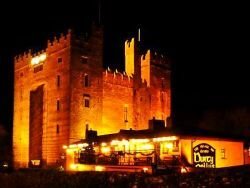 The show has birds of prey including Irish eagles flying directly over your heads, and sitting on and eating out of your hands. Meanwhile Lothar delivers a lot of information about birds of prey, all in a very entertaining way accessible for the whole family. There is a big focus on conservation. Birds of prey only fly when they have to find something to eat. Flying takes a lot of energy, and raptors like to conserve their strength for when they need it. Birds of prey are in no way a danger to man. The idea of them attacking children is a complete myth. During the show, Lothar had an eagle land very close to a baby just to demonstrate that fact. The eagle would be strong enough to grab the baby and carry it off, but he never would. Likewise, eagles don’t attack live farm animals. They will feed on ones that are already dead, but they won’t attack them. 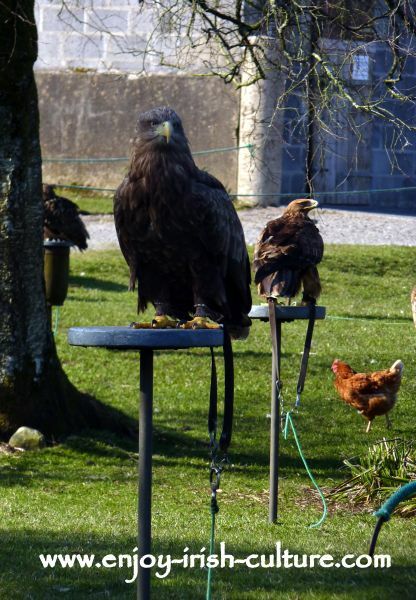 All this information is necessary to break the myths that are persistent in parts of Irish farming culture that eagles are a danger to livestock. The show is followed by a very well staffed and extremely friendly pet zoo experience involving pigs, goats, a lamb, lots of guinea pigs, mice and rabbits. I have rarely seen my son as calm as I have there, holding and cuddling a guinea pig. Our Opinion On 'Eagles Flying'? We say, go. Don't miss it. Go for a day trip if you can at all, even if you are not staying anywhere nearby! If you have kids, bring them not only once, but a few times. After all it's our kids who will be in charge o protecting these endangered species into the future. And what better way to teach them than by having fun! 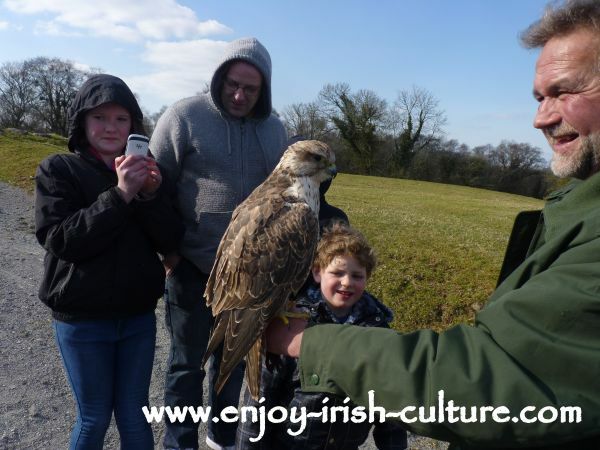 Combine the bird of prey experience with a visit to other sights in this part of the country to make a day of it: Carrowkeel, Carrowmore, Parke’s Castle, or any of the beaches at Streedagh, Strandhill, Easkey, or Kilcullen’s Seaweed Bath at Easkey. 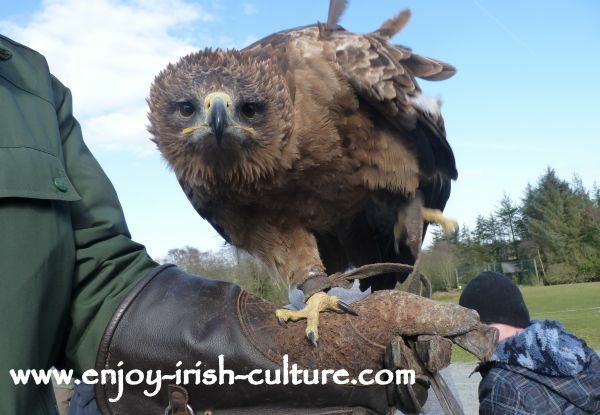 Hi there, hope you liked our article on 'Eagles Flying' in County Sligo, Ireland. If you like what we do on this webiste, please support us with a social shout out. We provide simple social options at the top left and at the very bottom. Thanks a million and warmest regards from Ireland from Susanna and Colm.